Neutron stars, also known as pulsars, are stars at the end of their evolution. They evolve from stars with masses ranging from 10 to 30 solar masses, and end as compact objects having a few solar masses, confined to a sphere just 20 kilometers diameter. PSR J2215+5135, discovered in 2011, is a neutron star in a binary system, in which the two stars orbit around a common center of mass. 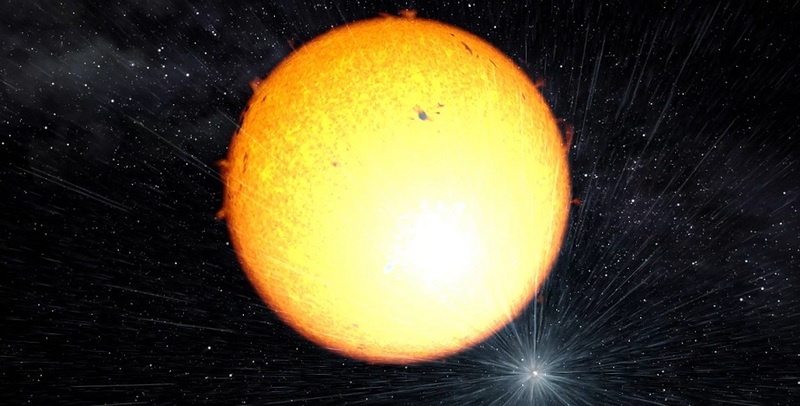 The companion star, or secondary, is of solar type and it is strongly irradiated by the neutron star. These results also suggest that, in order to support the weight of 2.3 solar masses, the repulsion between particles in the nucleus of the neutron star must be sufficiently strong. This would indicate that it's unlikely free quarks or other exotic forms of matter could be found in the center of this neutron star.